Since childhood, Diana Pepper has felt a close bond with plants and animals that has grown into a deep reverence for Life. 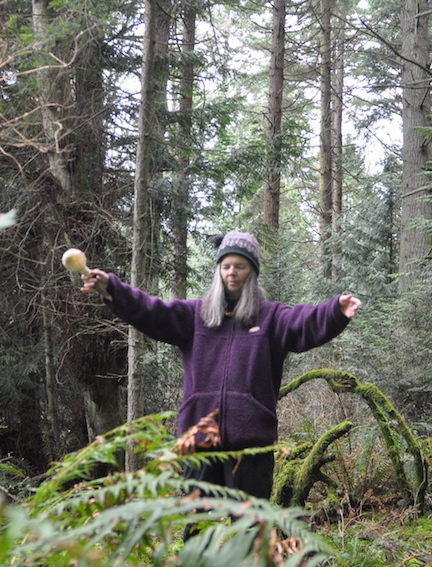 She now communicates with the plants, plant spirits, and fairies/nature spirits of Tree Frog Farm, and with angels and Teachers of other dimensions. Through Flower Essence Consultations and Energy Healing Sessions, Diana offers spiritually-based individual healing, a synthesis of more than 30 years of study, training and personal healing. Creating the Tree Frog Farm line of flower essences & aromatherapy products for human, animal and planetary health is a natural expression of her healing practice. She also teaches classes on flower essence making, personal and professional use of flower essences, and more. 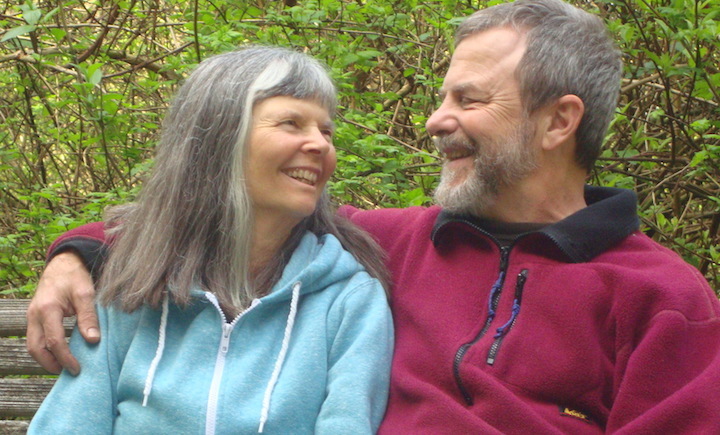 John has Masters degrees in Humanistic Psychology and Environmental Leadership, and 42 years of experience with various contemplative practices. After 25 years working in community mental health and the last eleven years with hospice, John is retiring and going “feral”. He supports and expands Diana’s work at Tree Frog Farm as co-owner, grounds and facilities manager and the resident go-for guy. And don’t be surprised if you catch him in the office helping with phone calls and orders. Together Diana and John established Tree Frog Farm Flower Essences in 2000. It grew out of our love for this magical land. All plants are grown chemically free using organic principles to support the health of the land and people using our products. Our flower essences come from the native, medicinal and ornamental garden plants that ecologically and energetically form the integrated dynamics of the land. By doing this, we are respectfully creating an environmentally sustainable business. On a daily basis, Diana communicates with our partners — the Overlighting Deva/Angel of Tree Frog Farm, the fairies, and the Teachers of other dimensions who guide us. Our intent is to operate in alignment with the highest purposes for Tree Frog Farm and for the benefit of all Beings. John purchased the land we call Tree Frog Farm in 1976 as a homestead, garden and Nature/Human sanctuary. It is 2.75 acres on Lummi Island overlooking the San Juan Islands in north Puget Sound, Washington, USA. Lummi Island is off the coast of Bellingham and Lummi Indian Nation near the Canadian border. It has a marine temperate climate with mild, rainy winters and warm summers. We love it here because this climate is ideal for nearly year-round gardening of perennial herbs and native plants. Tree Frog Farm is named after the nickel-sized bright green tree frogs that send up a chorus of creaky-door sounds in the woods and gardens. 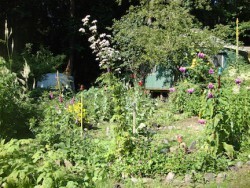 We have mature flower and vegetable gardens including our labyrinth medicinal herb garden. The woods are a mix of mature evergreens (including grand fir, Douglas fir and western red cedar) and deciduous trees like red alder and big leaf maple. Many of these are over one hundred feet tall. The understory is dominated by the many native wild berry shrubs and ferns, for which this region is famous. Many species of birds, frogs, and other critters call this land home.  Our philosophy at Tree Frog Farm is one of kinship with and respect for all Life. We take care not to harm any creature. As an example, we relocate slugs out into the woods instead of killing them. 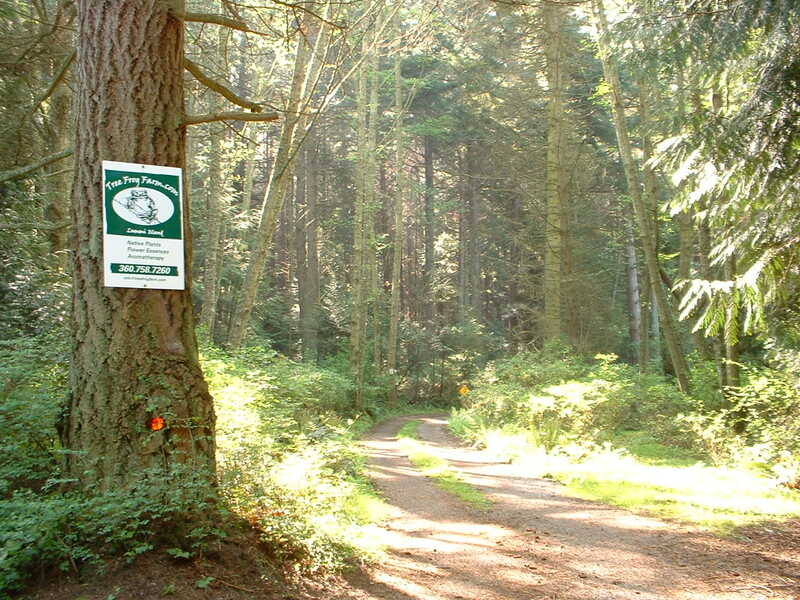 In 2000-01 Tree Frog Farm became a Washington State Department of Wildlife Certified Backyard Wildlife Habitat sanctuary, Backyard Forest Steward with the State Department of Natural Resources and a Sierra Club/Project SeaWolf Salmon Friendly Landscape. We support United Plant Savers who through education and research works to protect wild herbs that have become threatened due to overharvesting or loss of natural habitat. In support of protecting endangered herbs, we grow small patches of bloodroot, black cohosh, blue cohosh, trillium, wild yam, arnica, cascara, maidenhair fern, and Oregon grape. Diana makes flower essences of many of these. Our understanding of health follows our philosophy of kinship with and respect for all Life. We call it “healing to wholeness.” Each lifetime offers physical, emotional, mental, and spiritual challenges in our learning process. These challenges are healing opportunities. Health becomes then, not the absence of symptoms, but the returning to wholeness with All.